(Today's guest post is by Karaka Pend of Permissible Arms. If you would like to guest write for us, please check out our guest post guidelines. We look forward to publishing reader posts on future Thursdays. For anyone familiar with Batman, the idea that vigilantism is an expression of vengeance is generally understood. The tasks Batman ascribes to himself--to clear the streets of Gotham City of criminals, to defend Gotham from those who would destroy it--come directly from his experience witnessing his parents killed by a violent mugging as a child. The rubric is simplistic: cause (murder) --> effect (the Batman comes to life). 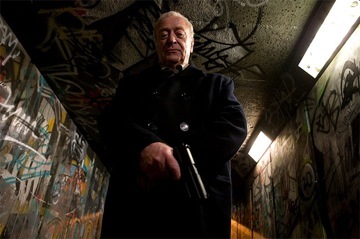 In "Harry Brown," Michael Caine is Batman. His Gotham City is an Elephant and Castle housing estate in South London; his secret identity is his service in the Royal Marines as a veteran of North Ireland. But unlike Batman, "Harry Brown" and its titular character distill the crux of being a vigilante down to its stark and often ugly search for what he or she considers justice. Harry Brown, a pensioner whose wife lies terminally ill in a nearby hospital, avoids the underpass where the local gang have established their base. The underpass offers a quicker transit between Brown's home and his wife's hospital room, but also acts as a haven for young criminals who terrorize the locals, including a couple attempting to walk through the underpass. Brown attempts to ignore it, and them, in favor of concentrating on being with his wife as she nears her death. Brown's only companions are the bartender at his local pub, Sid, and his fellow pensioner Leonard, with whom he drinks and plays chess. Brown's retreat from the world is evident: he exists in the flat that bears so many markers of his wife; in a chair by her bedside; in the pub with Leonard; and virtually in no other place. He is a man reduced. He learns that his wife is dying, and the criminals prevent him from reaching her bedside in time to say goodbye by blocking the underpass; Brown weighs the possibility of getting through the underpass with his clear need to be near his wife, and ultimately he chooses to take the longer path. 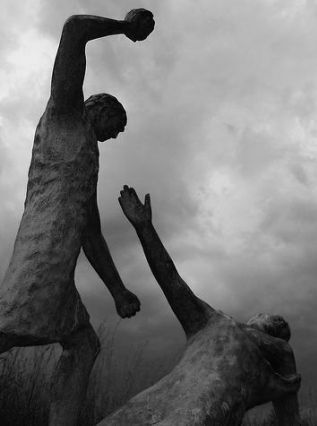 His anger is only mitigated by his grief, and for a brief moment it seems as though his grief will overtake him. That is, until Leonard, who has been a victim of the cruel pranks and provocations of the underpass gang, comes to Brown. Brown puts him off, suggesting Leonard should go to the police (who have dismissed Leonard's concerns). A moment before, when Len had asked Brown about his time in the Royal Marines, Brown says, "When I met my Cath, I knew that all that stuff had to be locked away. I made that decision all those years ago, and I stuck to it." It's clear he's unwilling to open whatever violence is in his past, out of habit, out of respect for his late wife. The gang kills Len that night after he goes to the underpass with an old bayonet following enflamed feces shoved through his letterbox. Suddenly Brown is thoroughly unmoored--his wife is dead, his best mate is dead, and all that is left is an anger and helplessness without a clear focus. That is, until he is mugged at knifepoint by one of the members of the gang. As an attacker thrusts a weapon in his face, his long-dormant training kicks in, and in one swift move Brown turns the knife on his attacker, stabbing him in the heart and leaving him to his death. Brown hurries home, mechanically stripping any evidence of his involvement from his clothes and body. All these experiences, and Brown's symbolic divorce from the world through the deaths of those two people who seem to have defined him, combine to galvanize Brown to action, a path of revenge and violence. This is a complicated movie, for all that the motivations are simple. Brown, portrayed brilliantly by Michael Caine, is a man whose past was marked by engagement with paramilitary forces during The Troubles in Northern Ireland. He set aside that capability when he married, and it would never had resurfaced had the deaths of his wife and friend not happened in such close proximity. Brown becomes a vigilante because it is clear to him that the police are ineffective in ending the threat of these gang members (and to a larger extent the drug traffickers he also kills). Hicock, one of the two detectives, says that if it is Brown doing these things, "then he's doing us a favor." The Inspector General doesn't believe Frampton when she suggests it the killer is Brown. Brown, thus, is in the perfect position to target and eradicate his enemy with little repercussion, which also contributes to his motives and choices. There's a remarkable--and purposeful--dichotomy between Brown as a frail older man, a pensioner, and the seasoned Royal Marine that seems to reside inside of him. It raises some fascinating questions: is training ever forgettable? Can you ever forget the things you have done, the lives you have taken? Brown, for whom life has little charm without his wife and friend, is willing to trade his own for a piece of vengeance, and more than succeeds in his goal. The film also forces the question: can violence only be matched with violence, one more powerful than the other? Brown manages to achieve what he does with an exacting series of actions, each one ending in death or injury to his enemy, where the police's attempt to charge on evidence fails. The riots initially push back at the intervening police force until the police bring in more officers and subdue the population of the estate. "Harry Brown" doesn't indicate that Brown is correct for exacting violent revenge on the gang, apart from Frampton's concern; but neither does it suggest he is in the wrong. Brown's violence has a target that the police have difficulty reaching, and in one sense he does indeed "do them a favor." He provides an opportunity for intervention without revealing his involvement. He operates in the shadows, setting up a scenario that does, eventually, end in justice. And he walks away from it all without ever being named. Perhaps this is what the best vigilante achieves--and what Batman cannot have: justice without acknowledgement. I love this review, it makes me want to see the film. I guess I wonder if Harry Brown ever has any doubts, whether he questions what he does? Whta is the effect of the violence on him? All Violence has a cost—which isn’t to say it doesn’t have a purpose—does this movie show that? It sounds challenging, and I want to see it. Karaka should have an analysis of the film on her site, and we’ll provide a link when it is ready. You know, I think part of the premise of the film is that Brown has lost himself so thoroughly in his grief that moral questions cease to weight on him at all. And the movie is mostly amoral in representing that—life, and this gang, has already cost Brown his final moments with his wife and the life of his best friend, so the pound(s) of flesh he takes in return seem almost allowable. Or at the least understandable. Brown, at the end of the film, has returned to being a frail pensioner, now alone; but he was alone before he started to kill in vengeance. So he hasn’t really lost anything more. It reminds me, correct me if I’m wrong, of “City of God” the brazillian mob drama (which I loved). Just morality gets trumped by survival. Funny that it is set in England. Thoughts? Well, that’s the paradigm of the vigilante, isn’t it? A skewed conception of morality that privileges justice—self-defined justice—over legal justice, over self worth. Skirts the edge of criminality in order to combat criminality. I do think it was very purposefully set in South London, to touch on the council and pensioner experiences that are part of English cultural memory, and also to further brutalize the film. England, and Britain as a whole, has largely ceased to be a hotbed of violence, and this questions that presumption. The setting seems like the most interesting part. England, the fictional England we/I have in my head, is of tea and crumpets, the queen and all that. Yet London is an incredibly violent city. I think the purpose of art is to illustrate new perspectives like this. All violence has a cost, and for Brown, perhaps that cost is his own inability to lose violent training so ingrained it has become instinct. And once a behavior is responsive, instinctual, without thought, how can it also involve all the things we would like to layer on like morality, ethics, and reflection? I don’t see it as a vigilante film. I see it as a portrait of the consequences of the very best training, out of context. Certain warriors are trained to perform certain actions in specific contexts. 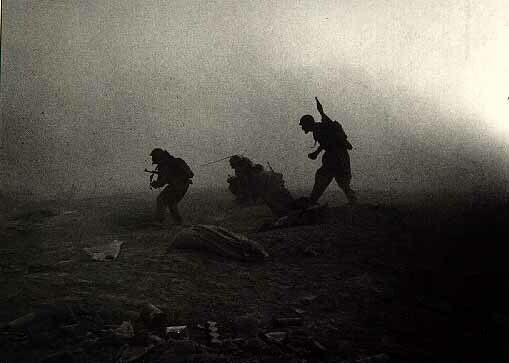 But those contexts do not, cannot, persist for what’s left of the warrior’s life. So what then? Something like the circumstances dramatized in this film: the rehabituation of self in regular life, a domestic patter, love, quiet. Yet the training waits, a dendritic connection waiting for its next pulse. I loved the ideas behind the film, was upset at the obvious exploitation of those ideas for mass market audience tastes. Eric, I actually think this was skewed slightly more as a British film, nay, an English film to question English cultural perceptions primarily. It was made with a British lottery grant, and there’s a fair amount of culturally-specific understanding that pervades the film. I do think it holds up cross-culturally, but if it questions American understanding of some aspects of British life, I interpret that as a secondary mode to the internalism of the film itself. The more universal aspects of it, for me, are the violence, the criminality, the grief, the rage. But I think the setting is firmly planted where it is for a reason. Trish, thank you for your lovely comments (as usual!). I’m interested in how you call it a warrior out of context, because I see that as a platform to tell a vigilante story rather than the story itself. Brown would not have been remotely as effective in his actions if he hadn’t have fought the Troubles, but it was only in setting that training and experience aside that he could engage in “normal” life. When that normality is ripped from him, he instinctively grasped onto the thing that had been built into him from decades ago. I agree that there are certain scenes in the film that are there to put butts in seats. But on the whole I do think it stands up to the dark interior questioning of the culture, the police in the film, and (hopefully) the audience. And you know — that is my weakness as viewing subject: I am always too drawn to the dark internal narrative in such films and see what passes as storyline as a distraction when it doesn’t fuel the trajectory of that narrative. A flaw, always, in my readings of anything cinematic. Ah, but that actually complements how I think very well, Trish. :) I think macro, you think micro.